This script places object exactly onto mathematically precise position between two other objects or on the line. For example on 1/3 of distance between objects or on drawn line. Sometimes you just need to find position which is equal part of some length and this script will help you with such situations. - new option (button) "Reset Controllers"
Reset Controllers - you can use it to reset controllers and this way remove constraints without affecting positions of objects. 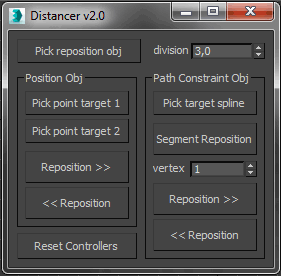 This will reset controllers of selected objects in non destructive way - for example you can use this to remove path constraint from objects without breaking their positions. Used to take position between two objects point target 1 - select object (first position point). Script will use position of this object. point target 2 - select object (second position point). With two position points we can divide lenght between them. Reposition >> - shift position up. Use it to take position from spline. "Reposition obj" need to use "path constraint") target line - spline selected with this option will work with "reposition obj" but there is another functionality - choose objects that use path constraint before you pick spline and it will deploy them spaced evenly along the line. Local(Segment)/Global Reposition - here you can switch between global and local/segment reposition mode. Local/Segment - uses length of specified line segments (from vertex to vertex). Global - uses full length of spline. vertex - jump to specified segment of spline and reset position. Use it with "Local Reposition"/"Segment Reposition". Reposition << - shift position down. It works only with "Global Reposition", for "Local Reposition"/"Segment Reposition" use "vertex" setting to reset position.